Komline-Sanderson takes care of its customers long after the sale. We stock common repair parts for all of our plunger pumps and have the expertise in the performance and maintenance of these pumps that is unequalled. Contact our parts department for all your plunger pump spares and our service department to assist you in maintaining your pump in tip-top shape. Komline-Sanderson stocks and sells a complete inventory of parts for all K-S pumps as well as those previously manufactured by ITT Marlow® and Wastecorp Pumps LLC. 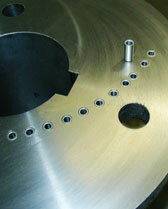 The K-S supplied parts are guaranteed to be equal to, if not better than, the parts on the existing pump. Marlow® is a registered trademark of ITT Industries. Wastecorp is a registered trademark of WPCI Environmental Brands.